I came into the world in Argentina, and opened my eyes to the colors in Morocco, but it was in Paris that I began sculpting at the age of 13 in the garden of the old American Centre with romanian artist Ion Vlad. I carried on studying in Strasbourg at the Ecole Nationale des Arts Décoratifs with the scupltor François Cacheux and completed my course of study in Italy , in Perugia and Murano. 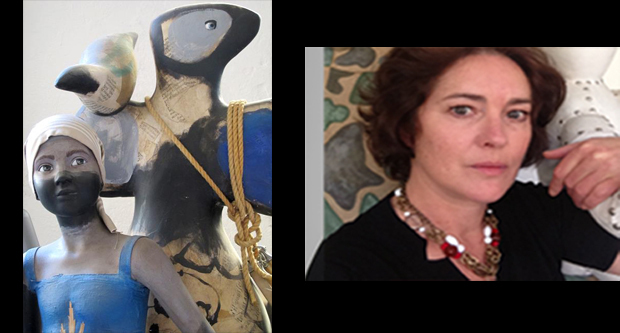 In Murano I worked and planned on spunglass sculptures and designware for years, before I settled in Milan,where I work with architects and landscapers , and on private commissions. I am particularly sensitive to the current news of the world, which is my primary source of inspiration, and especially how we absorb the enormous mass of information we are bombarded without any restraint. This visual information neighborhood, changed our perception of reality. I am a portraitist and I focus my artistic work on people I place in waiting position, sometimes critical, sometimes poetic. I use metaphors to exalt the alteration of our perception, and focus on the ambiguity of information dissemination to create small realities I mix as a puzzle, constantly evolving. I adapt the material on the subject to create my pieces, and use various kinds as clay, stone, wood, iron, resin and even fund material and I put colors on my sculptures, a remnant of my classical education made of meetings and collaborations with artists like Mimmo Rotella who taught me to use intelligible symbols and be attached to an immediacy of illustration. 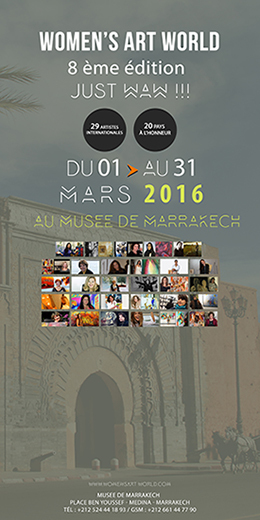 Les demandes d'inscription sont cloturées pour la 8ème édition du WOMEN'S ART WORLD qui se déroulera à Marrakech du 01 au 09 Mars 2016. RDV pour la 9ème édition du waw de l'année prochaine. Cet événement ne pourra accueillir qu'un nombre limité d'artistes. les participantes sélectionnées seront avisées par e-mail.